Tap Share Keys at to reveal the personalization box. 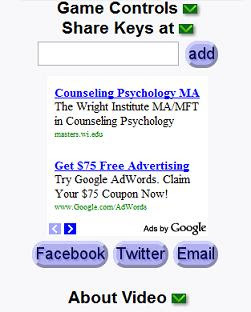 Tap a button to share at Facebook, Twitter, or via email. Tap here, to learn more about customization. Here is the fastest tutorial - in ten seconds. Tap or click through the image to try what you have learned. A major UK publishing group complimented us for our simple design. We believe the best designs deliver simple solutions that extend to solve thousands of complex problems. From evergreen, predictive magazines to reporting the world news or simple systems to learn English, our staff solved hundreds of unique, nagging problems and adapted Keys to thousands of uses. Enjoy! Tap to learn about horses! You can customize the terms in your app. The latest version also allows custom slideshows that don't depend on the results from search. 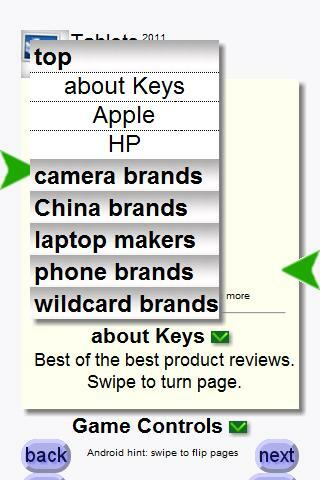 The Keys Mobile platform uses keywords to search Google, Bing, and Yahoo for images, videos, and links. 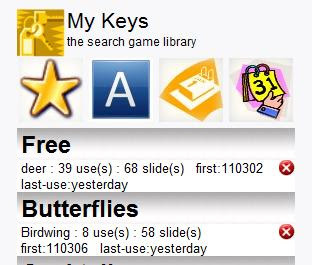 Keys can also access list of photos stored at Flickr, Picasa, Youtube, or other structured websites via their RSS feeds. In the top-right example, we've changed the Tablets War app to include an opening slideshow (ie about Keys) that self explains the Keys platform. Each slide has a custom link that redirects the user to any web page to learn more about a topic. This instructs Keys to access the feed for this-term in your customized app. We can improve lessons and information delivery about Keys or an app directly inside the app. eg A slideshow can introduce the contents of an app. A magazine provider can include information from their latest issue as a slideshow. Advertisers can include their own slideshows as a term of an app. User groups can participate and improve the relevancy of information inside an app. Keys retains all rights - including copyright, trademark, and patent-pending related to this new design. As we expand our partnerships with information providers, look for more improvements to the app content. Enjoy! A new page lists the apps that you have used. Tap the Game Controls to reveal the my button. Tap the my button for the page below. Icons at the top of the page sorts the list by most-used, alphabetic, first-use, and last-use. Tap an icon to change the list order. Each row lists one app, bookmarked term, use stats, and dates. The red button allows you to delete an app. Tap a row to restart an app with the bookmarked term. To discover more apps, tap the keys icon at the top-left. Keys automatically saves both free and paid apps in this library. This data is private to your device only. This library shares across tabs within one browser of one device. It does not share across browsers, devices, or with other users. Enjoy and share. Tap to learn about sharing. We've added features to customize and share Keys mobile apps. Here are the details. Tap Share Keys at to reveal the input box. Tap the box to enter any keyword term. e.g. type in your own name. The term is added to the table of contents; and your app shows the search results. This feature is available for use in Learn, Watch, Match, and Slots; but not Guess. You can select any term from an app, and share that term with friends at Facebook, Twitter, or via email - including custom terms. Tap the Facebook, Twitter, or Email button. Complete the post at those websites. Here are the features of the advanced customization. Any keyword becomes a new term. Keywords separated by commas or semicolons become a term list. e.g. red; blue; green The list can be very long. Don't use semicolons, colons, and at-signs as part of your keywords and clues. Edit the search list to replace your custom changes. Replace with a blank list to delete your edits. A keyword can have a custom clue. Use the colon (ie :) to separate the term and clue. e.g. John Doe:He is a ham or Mary:Sweet hear. ;John:What a joker! Each keyword can have a custom search term that is different from the keyword. Use the at-sign (ie @) to separate the term and search phrase. e.g. Me@John Doe or Me@John Doe:What a joker! Customize-and-share uses the new bookmarking feature. 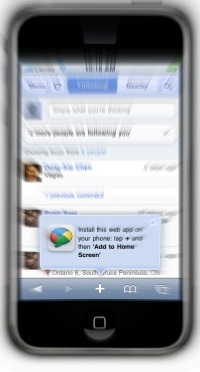 It's supported on iPhone, iPad, iTouch, Android, Palm Pre, Blackberry OS6, and most modern browsers. Our gallery of apps has grown to 500 apps and will continue to expand to thousands of subjects. Bookmark and track your favorites on your phone. We started with an audience that was 95% from the United States. Although the USA audience continues to grow, the international audience has already become 40% of our visits. Since the USA phone use is less than 10% of the world usage, we expect the international share to continue it's explosive growth. In most countries, the phone is the only means to access the Internet. We've diversified our coverage to better serve the interests of users from around the world. Academic subjects, such as the sciences, have a global commonality. Lifestyle issues vary by continent, country, and region. Our collection of 50 apps and 25,000 recipes barely covers the food tastes from around the world. The USA is passionate about football and baseball. South Americans and Europeans are equally excited by the original football competitions. Northern countries like Canada, Finland, Sweden, and Russia can't live without ice hockey. 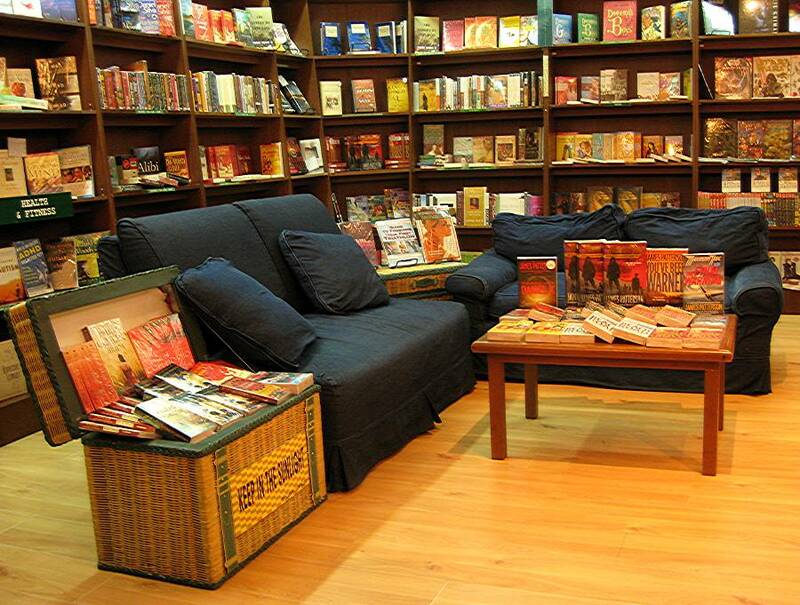 Thus, our gallery has expanded dramatically. Our focus to serve the global community expands beyond the ability of our gallery to showcase every app. Too many apps per category would lead to overwhelming confusion. Our gallery highlights new and interesting apps of seasonal interest. The right flow selector has become a contextually sensitive gallery to discover more apps on similar subjects. You should not depend on our gallery to track your favorite apps. The gallery is a means to discover new apps. Your downloads and bookmarks create your personal gallery on your phone. Features such as the grouping of icons on the Apple iPhone OS4, or the organization of icon pages on the Palm phones allow you to personalize the collection. When you see an app you like, remember to bookmark that coffee-table app. Will your phone become your new, coffee-table? All apps have been updated to include the new, slide-show activity to aid learning. We've improved our focus on learning. Flow selectors group relevant terms into chapters and sections. Unlike an alphabetical glossary that makes the list of terms long and cumbersome, grouping puts terms into topic context which aids learning. Association of terms with images from search results from Google, Bing, and Yahoo accelerate understanding and comprehension with what academics call unconscious competence development. This is the painless way to learn. When terms have multiple meanings outside of the context of the target subject, the search services provide more rich images, as well. The alert user notes the variations and develops conscious competence of the term when used in a context different from the target subject. Most importantly, the mobile devices themselves have helped learning. We've observed groups crowd around one device, changing the public image to learning is cool. This is wonderful. Each Keys app targets a subject and an age-group - ie kids, teens, adults. Activities within the app support learning. Spin uses a slot-machine model to show terms. Although conservative educators may object to the gambling image, this activity has been the most used, probably because of the simplicity of the model. Frequent use means learning - which is a good outcome. Match is the classic concentration game. The game itself teaches focus. Paying attention earns the reward of finding the matching images - and the unconscious memorization of the target term. Guess is our original, innovative Pictionary with search robots game/activity. Robots tirelessly supply images based on a term. What term was used to generate the image results? We'll continue expanding the set of activities to keep learning fresh for all users. The latest activity simulates flash cards with our unique presentation twist. Each card presents a term and its definition. Images are pulled from search engines to support the presentation. Unlike the other activities, we've pulled a high resolution image from Microsoft Bing for this activity. This has the positive effect of better images - but the negative result of slower image access - particularly when used with slow 3G networks and/or slow image servers. If this problem is wide-spread, we may change to low resolution images for this activity. Every image is a live link to the source. Users can learn more about a term by tapping the image. In summary, embedded search results uniquely support our implementation of the classic flash card model. We call this the expandable flash card (excard) model. 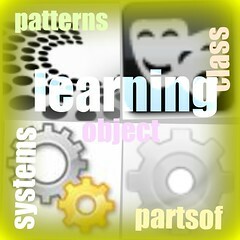 Isn't this the right model for web learning? Each mobile platform has different processes for upgrades. For most, the upgrade is automatic and there is no additional fee. Click here to see an example. Click here for Bio-series support. Gaming brings addiction to learning. That is a good goal. Elementary school content is simple to present. Flash cards entertain kids. As we add high school, college, adult-level content, the challenge increases to present the quantity and complexity of information; and context of knowledge. The series includes over 4,000 unique terms - while the average adult learns 20,000 words over a lifetime. Over 50 chapters, 200,000 images, and unlimited levels support the bio-series. Both the quantity and complexity of terms change how information needs to be presented. Look for more learning-series from tEarn as we expand other subjects using the same, new model. Also, give us time to update the content for existing games. Our games deploy simple models. Match is the classic concentration game. Slots spins. And Keys is our Pictionary with a search robot. Our goal is for learners to spend time with content, not learn complex games. For the bio-series, we bring over 200,000 relevant photos and links via search bots to aid learning. The Flow-Selector activates the list of target words, phrases, and facts. Touch or swipe to activate. Also, touch or swipe to hide the list. For long lists, touch to expand or hide sections of the cheat sheet. For the match and slots games, the flow-selector selects new terms to learn. For the keys game, the flow-selector is an alternative to typing for guessing an answer - necessary with complex terms. These changes simplify the model for the innovative keys game, hiding the 'cheats sheet' off-screen. Use the chapter selector to select different chapters. The grouping of related terms on the cheat sheet shows the context of terms within systems. This expands learning methods over an alphabetical list - which is suitable and still used in Version 4 for simple lists. Coyote, dingo, dog, fox, jackal, and wolf are related as canines with sharp teeth. Kangaroo, koala, wallaby, and the common opossum are related as marsupials that bear their young in pouches. Ferret, hedgehog, and shrew are not rodents even though they look like the same class as the beaver, chinchilla, chipmunk, gerbil, groundhhog, and mouse. For advanced subjects, glossaries often define new terms using terms that we don't know. We call this the recursive problem. How do learners comprehend the concepts when unknown terms define more unknown terms? Terms in context helps learners to comprehend complex knowledge through grouping. Identifying patterns and putting knowledge into buckets are a few of the advanced concepts for learning and innovation - identified through my AI days at MIT. A recent report suggests that the average student learns only 5 to 10 words over a six-week period at public schools. This is a huge problem. Our goal is to achieve that reading comprehension - every day. There is no FAQ for Keys, no bugs, no complexity - just learning fun!. Over 100,000 users have downloaded one of our apps. But, Apple, Motorola, and Palm insists on having a support page ;-) So this page will have to suffice. Here's a link to access one v4 game. Do note that if viewed over the web, please use Safari or Chrome to best simulate the mobile user experience. Firefox and Explorer use delivers a very different experience - and is not supported. For email support or to just to send a compliment, click here or the Contact link in the footer.